This quaint and cozy cottage in walking distance to the Harbor is nestled at the end of quiet road and has a beautiful spacious yard with picnic table and grill. The wrap-around deck is a great place to sit out in one of the Adirondack chairs to just relax or enjoy a good book. Explore your surroundings by taking the adjacent trail to the Penny Lake Preserve or take a leisurely walk to the Boothbay Harbor waterfront where you can enjoy activities from sailing to kayaking, shopping, eating in one of the Harbor’s restaurants, or perhaps catch an evening music performance at the Boothbay Harbor Opera House. The cottage has a washer and dryer; a well-equipped kitchen with microwave; and a living room with cable TV, DVD and Wireless Internet (Wi-Fi) that is accessible throughout the cottage as well as outside on the wrap-around deck. There are two bedrooms: one bedroom on the first floor with a queen bed and one bedroom upstairs with two twin beds. For your convenience there is a small shed where you can store your bicycles and luggage while staying at the cottage. Full Bath with combination tub/shower. Washcloths and bath towels are not provided. There are dish towels. Walking distance to the Harbor. In-town cottage in a quiet neighborhood that is within walking distance of the downtown Boothbay Harbor area with all the shops, restaurants, kayak rentals, and sailing and excursion boats. Off-Street Parking for two vehicles in cottage driveway. The cottage is in walking distance to the Harbor saving you from having to pay downtown parking fees. Wi-Fi throughout cottage As well as outside on deck and in yard. Seats 4 people comfortably. There is a 32” Flat screen HD television with cable (including 135+ channels & On Demand), that is connected to both a DVD and Roku Player. 10 cup Cuisinaut coffee maker & a 1 cup Black and Decker on-the-go coffee maker. Great kitchen with plenty of counter space. Fully Equipped. Lobster Pot and accessories. Table in dining area seats 4-5 and there is also a picnic table in the yard that seats up to six. Located in the Living Room is a 32” Flat screen HDTV with cable that is connected to both a DVD and Roku Player. Cable: 135+ channels plus HD and On-Demand. Portable stereo AM/FM radio with CD & tape players. There is also an all in one TV/VHS player located upstairs. Some good reads and also children's books and books about Maine and the local area. Wooden blocks, Lincoln logs, Brio train set and wooden puzzles. Nice Yard, Croquet Set, Picnic Table (seats up to six). Wrap-Around Deck with Covered Area. Seating for 6-8 people. The cottage is equipped with fans, fire extinguisher and smoke/CO2 detectors. Small shed adjacent to cottage contains extra fans and deck chairs and a child gate if needed. Guests can also use shed for storing bicycles or luggage while staying at the cottage. Quiet neighborhood. Close to downtown Boothbay Harbor. About 5 minutes walk. Next to wood trails in the Penny Lake Preserve. Can go to grocery or drugstore by walk in about 15 or 20 minutes. This is an authentic cute cottage with original windows, vintage interior doors, cedar shingles, etc. Charming place & charming owners. Enjoying drinking a cofee each morning on the porch/balcony equiped with chairs and tables, in the shade on covered East section or the sun on open South section. Bathroom and kitchen are clean and functionnal. This cottage was very comfortable and cozy. Everything that you need during your stay is right there. It is close enough to the harbor that you can walk into town to shop, take a cruise on one of the boats, eat dinner and have ice cream. The property owners, Skip and Cyndy, are very personable and make you feel right at home. It was a great place to relax and unwind. We really enjoyed our stay there and would do it again. My husband and I absolutely loved our stay at Skipper's Cottage! It's at the end of a dead end street in a very quiet and safe neighborhood, yet only a five minute walk down the hill into town. It had everything we needed and more. We were very comfortable there. The cottage is clean and well taken care of. We only wish we could've spent more time there! We kept very busy exploring. We loved Boothbay Harbor and also visited Wiscassett (make sure you go to Red's Eats and get a lobster roll! ), Bath, Freeport, Ocean Point (in East Boothbay), Porter Preserve on Barters Island, Newcastle, Damariscotta, Bristol and my favorite, Pemaquid Point Lighthouse! Cyndy and Skip were super helpful! They have a binder full of information on the area including restaurant menus, places to hike and local activities like boat tours etc. They were just a phone call away if we needed anymore information too! They were so friendly and accommodating! I highly recommend Skipper's Cottage! We hope to return! We loved the cottage and it's quaint character. Lovely, large open deck, the house was well stocked with classic board games that our children (and the grown ups) enjoyed. It is conveniently located close to downtown Boothbay Harbor. The gas stove was a welcome sight for a family that enjoys cooking. Cozy cottage in quiet neighborhood close to harbor fun! Boothbay Harbor was a lively and busy harbor spot. The Ericksons provide everything you would need and are very friendly, easy to contact, and accommodating. The space was perfect for a family of four and we enjoyed the 5-minute walk into town. The boat tours and Ocean Point rock hopping are a must and close by. Popham beach is always a favorite and seems to be among locals as well. We love Maine! 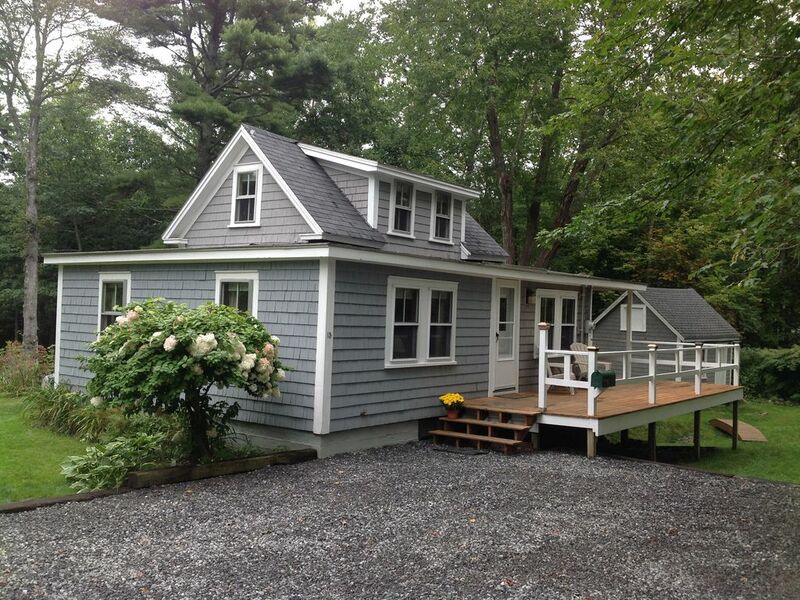 We had a wonderful time in Boothbay, complimented by this lovely summer cottage. It is perfect for s family of four. Our children loved the quiet of their second floor bedroom hideaway! The cottage is in the perfect location to walk to town, yet is on a quiet street with no thru traffic and nice neighbors. The spacious yard backs up to a reserve, and the tidy landscaping full of summer flowers were a nice homey touch. The cottage is riddled with historic Maine charm, yet has all the modern amenities with multiple TV and movie options, wifi, modern kitchen, etc. We also enjoyed all of the board games and puzzles. The owners are very hands on and accommodating as they are locals themselves. We definitely recommend staying here.